1 Fly Fishing In New Zealand. Fly Fishing In New Zealand. If you love the art of fly fishing and especially fly fishing for wild stream breed trout then you should certainly plan your next trout fishing trip to include New Zealand’s stunning and remote rivers and lakes. A fishing trip of a lifetime. This New Zealand guide to fly fishing in New Zealand is here to assist and ensure that you have unbiased inside information so that you will be properly equipped and prepared for trout fishing in New Zealand. New Zealand has many pristine, seldom fished, backcountry fly-fishing rivers and smaller streams, these rivers are accessible both in the North and South islands of New Zealand, most of these rivers have easy access from our main roads, others will require hiking into. You can fly into areas seldom seen by even local trout fisherman test your fly fishing skills in crystal clear waters offering hard fighting wild trout you will be fishing for both brown or rainbow wild trout. 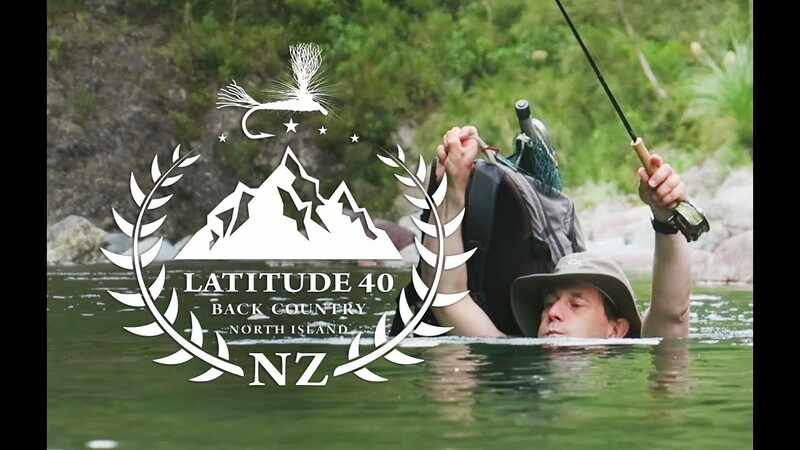 Most of the wilderness fly fishing spots in New Zealand you are encouraged to catch and release. New Zealand offers some of the best “big wild brown trout” fly fishing in the world. But it is not an easy task to fish for these crafty old river trout, local knowledge or a professional fishing guide would give you the edge in defeating brown trout in their own environment. If you choose to self-guide all Hunting and Fishing Shops local to your chosen fishing spot will have a wealth of local knowledge, and are happy to pass it on to visiting fisherman. Fly fishing in New Zealand for wild trout will not only extend your skills but I’m sure it will also help you to develop some new ones as well. Trout fishing New Zealand carries some important differences when it comes to fly fishing in comparison to fly fishing in US or UK. The biggest difference in our opinion is sight fishing. 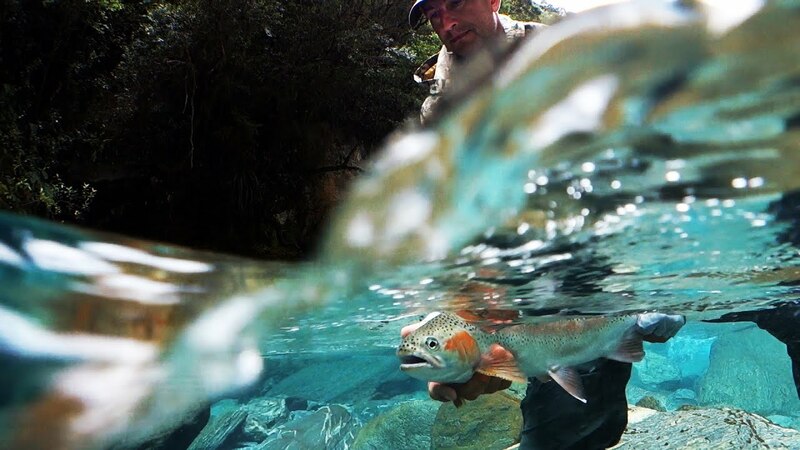 Unless running brown with silt after heavy rain New Zealand river fishing is often in quite shallow crystal clear water, so being able to clearly see your target fish and them see you adds to the excitement and the challenge of obtaining a successful strike. Generally, bigger trout control or occupy more of the river so are fewer in numbers but there are normally very big fish found in every mile of water. Up to 500 trout might be living in every mile in the best fishing rivers and some streams will only carry around 10 fish in a mile of water. These trout are often bigger and a lot more wary so require some skill to catch them. As the number of fish are less and more schooled each encountered fish needs good fly fishing skills. You may only get one chance to target a sighted fish, especially in summer when the water flow is often low. So you need to be silent and careful in your approach and don’t disturb or enter the water unless essential to do so. If you are new to trout fishing and wanting to learn from a local expert there are many skilled fly fishing guides for hire in New Zealand you will benefit from both their fly fishing skills and their local knowledge of the rivers and flies used in the area you choose to fish. It may only require a half day of instruction to set you up for a more rewarding fishing trip. Though whether you are a seasoned fly fisher and go it alone or hire a guide you will find quality rivers and lakes to fish in and will definitely enjoy fly fishing in New Zealand.